If you haven’t seen M. Night Shyamalan’s two previous films – Unbreakable (2000) and Split (2017) – you may be a little lost because this conclusion to his trilogy brings together the main characters from both films. Ultra-strong David Dunn (Bruce Willis) believes he’s a superhero, utilizing his remarkable abilities as a crime-fighting vigilante, assisted by his loyal son Joseph (Spencer Treat Clark) with whom he runs a security company. His arch-nemesis is brittle-boned Elijah Price (Samuel L. Jackson), who calls himself “Mr. Glass” and uses his maniacally sinister intuition to manipulate the people around him. 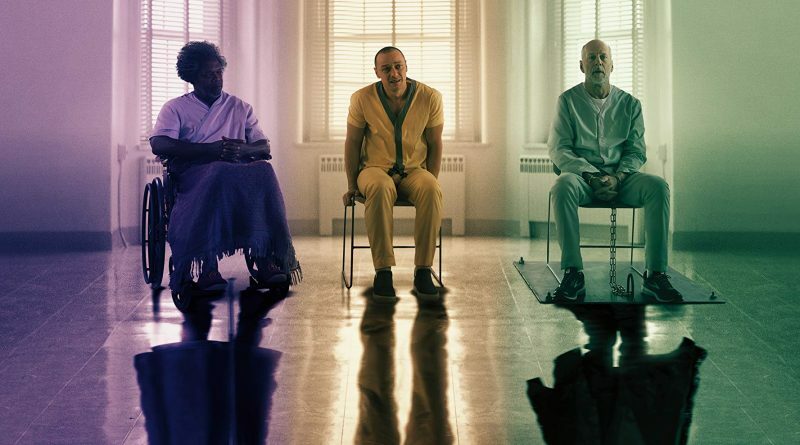 Price’s current victim is troubled Kevin Wendell Crumb (James McAvoy), who suffers from dissociative identity disorder, meaning that he has at least two dozen different personalities. The one who intrigues Price is “The Beast,” a serial killer. When they’re caught by the police, they’re all confined in a Philadelphia psychiatric hospital, where Dr. Ellie Staple (Sarah Paulson) has developed a way to deprive these so-called “delusional” prisoners of their alleged superpowers. Or has she? Writer/director M. Night Shyamalan (The Sixth Sense, Signs) is smitten with infusing sci-fi thrillers with pop psychology. Sometimes it works, other times it doesn’t. Although the actors do the best they can, Shyamalan’s strident, humorless, idiosyncratic script is filled with exposition and far too complicated, and Mike Gioulakis’ cinematography is often more distracting than intriguing. Plus, there’s a trouble development with Casey Cooke (Anya Taylor-Joy), the sole survivor of The Beast’s attack in “Split,” before they all meet their ultimate fates. On the Granger Movie Gauge of 1 to 10, Glass is a contrived, absurdly fragmented 4, emerging as far too ambiguous to be satisfying.